Size chart 92% polyester/8% spandex wicking pinhole mesh body. 100% polyester wicking smooth kn.. Size chart Self-fabric lap v-neck collar ..
LIMITED QUANTITIES ! Please call for availability !Size chart 100% polyester wicking smooth kn.. Size chart 100% polyester wicking smooth knit * 100% polyester wicking Duo Knit inserts * Odor resis.. Size chart Light weight 90% polyester/10% spandex knit * 90% polyester/ 8% spandex wicking pinhole m.. Size chart 90% polyester/10% spandex knit * 93% polyester/7% spandex mesh inserts * Odor resis.. Size chart 90% polyester/10% spandex knit * 92% polyester/8% spandex wicking pinhole mesh inserts * .. Size chart 92% polyester/8% spandex wicking pinhole mesh * Wicks moisture away from the body * Girls.. 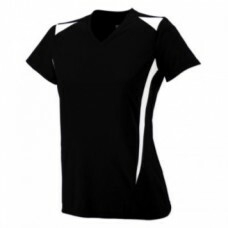 Size chart 92% polyester/ 8% wicking pinhole mesh * Wicks moisture away from the body * Ladies..